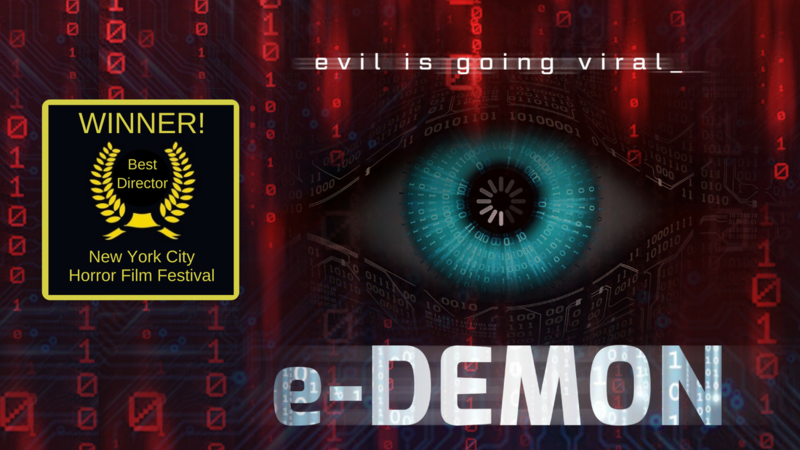 You can watch e-DEMON on iTunes, Vudu, Google Play, YouTube, Amazon Instant Video or get the DVD/ Blu-Ray at Amazon. You can also find e-DEMON at the ​DirectTV, Tivo, Dish Network, PlayStation, and Comcast, Cox Communications, & Charter via InDemand. The e-DEMON recording is a wakeup call to understand the truth of what’s happened to our world ever since the manipulative e-DEMON was released from its prison. You must watch to witness that first night of demonic possession as it turns a group of friends against each other. Since this demon can possess multiple people, knowing who to trust is the key to survival. Watching this web-recording is a heart-pounding, roller-coaster of an experience, but remember this is a human story because real flesh and blood people died that night. ​Former college friends, Kendra, AJ, Mar and Dwayne, found themselves growing apart. 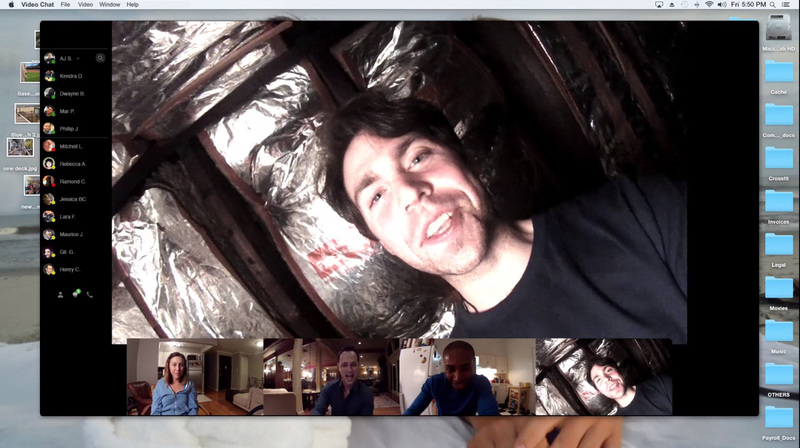 Attempting to hang on to their good old Ohio State days, the gang got together for a night of stories, pranks and drinking via web-cam. As the evening progressed, they unknowingly released a deviously clever demon that had been trapped for centuries in Salem, Massachusetts. Since the demon can possess multiple people at once, the group of friends did their best to determine who they could still trust in order to survive the demon's dark and twisted mission. Jeremy Wechter, Michael Gonzalez, Leah Chen Baker, Juni Li, Andres Lopez, Amanda L. Broomell, Chancelle Mafoua, Clodagh Power, Jackson Warner Lewis, Engin Kaplan, Wesley Huang, Ruben Almeida, Connor Lawson, KJ Hanna, Devan Saber, Jacob Below, Rob Maisonet, and Matt Brunson-Cline. Jeremy Wechter, the writer/director of e-DEMON, is known for directing the celebrated off-Broadway musical comedy Little House on the Ferry, his screenplay consulting service Script Weaver and his countless short films, commercials and music videos. Jeremy also teaches screenwriting, filmmaking, and acting at Gotham Writers Workshop and The New York Conservatory for Dramatic Arts. invites you to take a deep dive into the dangerous world now that the e-DEMON has been released. The Resistance Leader must remain anonymous or else the possessed will converge and destroy. The e-DEMON recording is a wakeup call to understand the truth of what’s happening to our world ever since the ruthless e-DEMON was accidentally released from its prison. Witness that first night of demonic possession as it unfolds in realtime as documented in a recorded video-chat. Released into our era, the manipulative demon is able to use modern technology to speed up the possession process. Watching this web-recording is a heart-pounding, roller-coaster of an experience, but remember this a human story because real flesh and blood people died that night. Be on the look out. The e-DEMON twists reality into a living nightmare of manipulation. 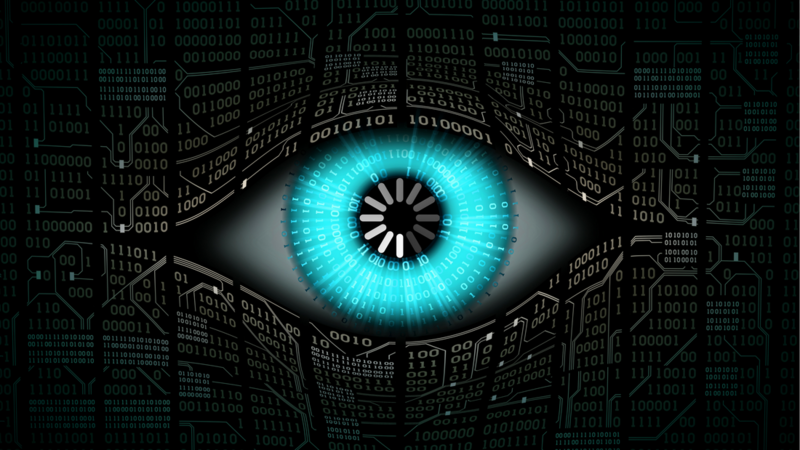 As this recorded video-chat documents, it builds in waves of growing tensions as it spirals inward engulfing its victim until they don’t know what is real or who to trust including loved ones, paramedics, the police and more. 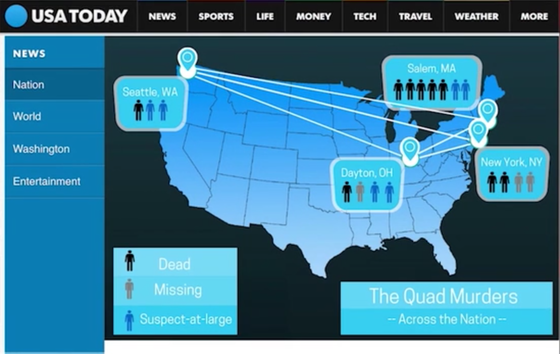 Watch to learn the truth of what really happened that infamous night now dubbed “The Quad Murders” by the media. In the e-DEMON video you’ll witness many were compelled to fight for their survival, just as others succumbed to this demon known as Viralesmalum (viral evil). We hope you’ll be one of the fighters. Please report any suspected or confirmed possessions. 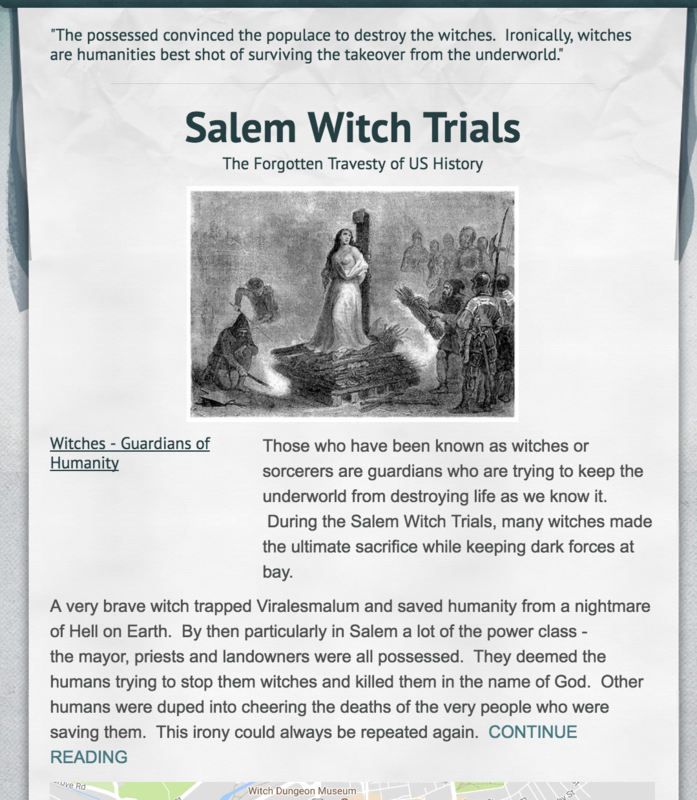 ​We aim to finish what Wallace bravely started that night. 10 FAQ: The e-DEMON and our mission to stop it. Why form the organization e-DEMON Resistance Network? Our organization formed the night the demon was released and our founder was informed. The Resistance leader recognized that it would take a team of people to carry out the mission especially after witnessing the brave and tragic result of watching Wallace Crenshaw try to defeat the demon on his own. What is the mission of e-DEMON Resistance Network? Our mission is to find the devil child and destroy it before it reaches six years, six months, and six days old. If we fail, it will open the gates to hell submerging Earth into a permanent living nightmare. What/ who is this e-DEMON? The original Latin name is Viralesmalum (viral evil). 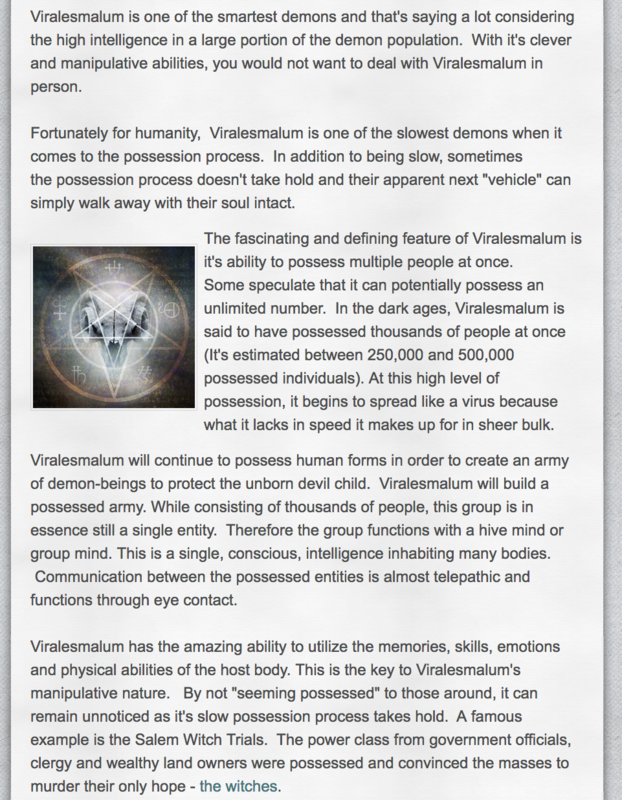 Excerpts from Wallace Crenshaw’s witchcraft website read “The fascinating and defining feature of Viralesmalum is it's ability to possess multiple people at once… Viralesmalum has the amazing ability to utilize the memories, skills, emotions and physical abilities of the hosts’ bodies. This is the key to Viralesmalum's manipulative nature. Viralesmalum will build a possessed army… to protect the unborn devil child.” Unfortunately for us, the devil child has already been born and our mission is to destroy it. What is the video e- DEMON screen recording all about? 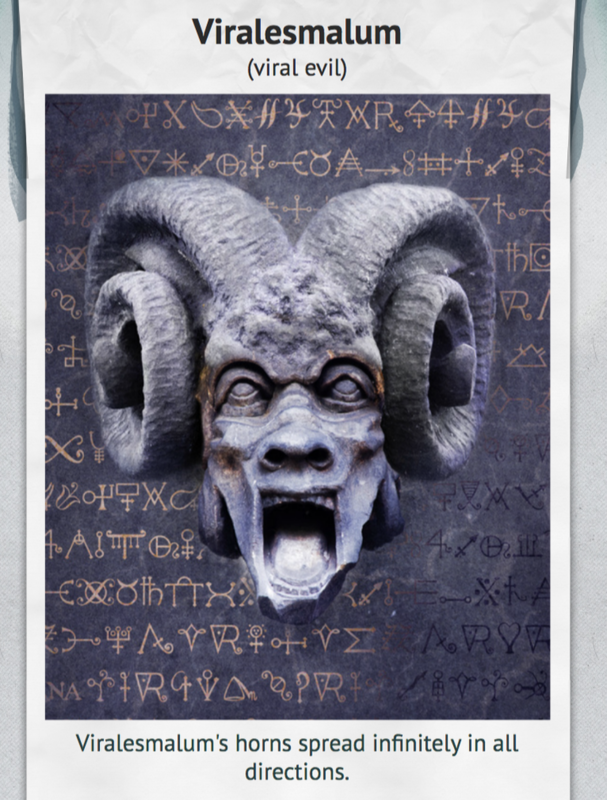 It’s a video-chat recording that documents the release of this ancient demon during a prank gone horribly wrong by a group of former college friends. 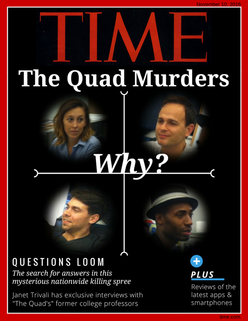 The media dubbed that night The Quad Murders, but we don’t use that label since it’s misleading. It also misses the bigger issue of the demon being released and successfully going through with the impregnation ritual. 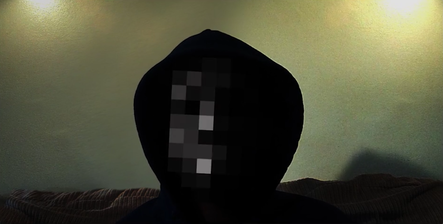 Some skeptics say e-DEMON Resistance Network edited the video chat recording from the night of the Quad Murders. 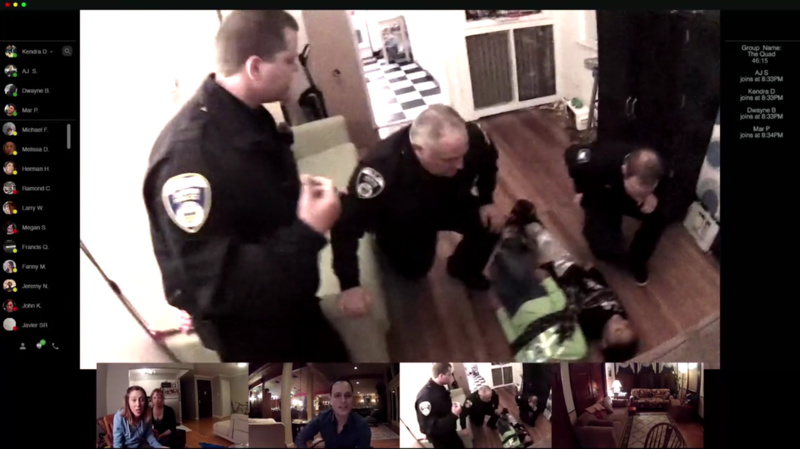 Was the original web recording tampered with or edited in any way? No. 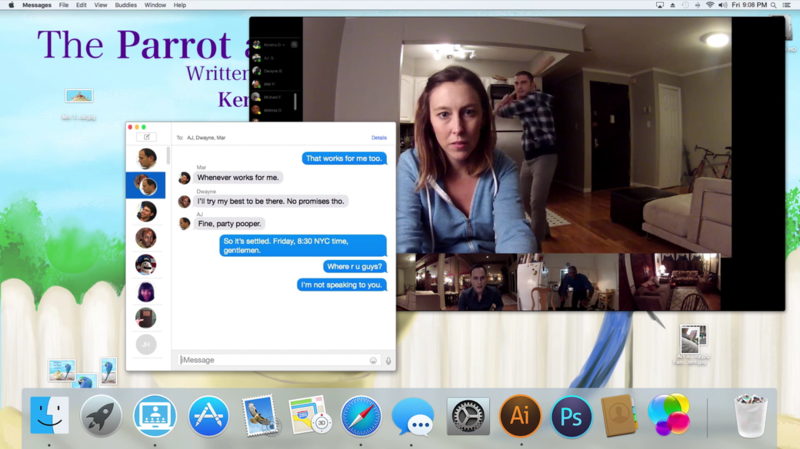 The original recording of the video chat is just as it happened. The Resistance leader put our mission’s message as a prologue and epilogue, but we did not adjust any of the recording from that night. As opponents have suggested, does e-DEMON Resistance Network advocate the practice of witchcraft? And violence? Let me be as clear as possible. Yes to witchcraft. No to violence. The last thing anyone needs is more senseless bloodshed. How can e-DEMON Resistance Network prove its claim that demonic possession is a real phenomenon? First, watch the recording from that night and all the other material we are gathering. Second, look out how bizarrely so many people are behaving in the world since that night. And please be on the lookout for people close to you behaving strangely all of a sudden. What is e-DEMON Resistance Network going to do about the increasingly vocal group Boycott e-DEMON Movie? You previously said, you think they are probably possessed. Do you still believe that?I don’t want to speculate on who may be possessed without definitive proof. Whether this group is lead by the possessed or not, it doesn’t really matter because our approach will be the same. We are going to fight their propaganda war with the one thing that can defeat them. Factual objective information. In other words, the truth. Can you prove if someone is possessed? We are working on that. That’s one of the reasons we put out the call for people to pitch in and help. Our goal is to create a definite barometer to know if we’re dealing with the possessed at any given moment. Inside our organization, we’ve created a protocol with our team members, but we’re all looking forward to when it can be more definitive. How can people get involved to help e-DEMON Resistance Network? You can share the e-DEMON recording and get as many people to watch it as possible. People need to know the truth. Second, you can donate. Third, you can get involved by contributing your skills. We are looking for witchcraft practitioners, occult experts, hackers, programmers, trained fighters, weapon experts, historical scholars, neurologists, biologists, graphic artists, and social media gurus to help spread the truth. PLEASE NOTE: We're not looking for reckless vigilantes. More haphazard bloodshed is the last thing anybody needs. e-DEMON © COPYRIGHT 2018. ALL RIGHTS RESERVED.